Frank & Kraft Attorneys at Law is an estate planning and elder law firm serving clients in the Greenwood, Indiana area. Our experienced team is committed to helping clients in Greenwood manage all of the complex legal and financial issues involved with estate plans and other end of life concerns. We work with you to protect your assets and ensure that they are distributed in accordance with your wishes when you pass away. In addition, we can help you prepare the strategies you need to have in place to safeguard your interests and protect you and your estate in the event illness or injury leaves you incapacitated. When you have estate and elder law concerns, out attorneys and support staff are here to ensure that your planning efforts secure your estate and your legacy. Greenwood, Indiana is located a mere fifteen minutes from Indianapolis, inside Johnson County. Its residents thus live in a county that ranks among the top five in the state for overall growth. Many people are attracted to the area for its reasonable cost of living and tight-knit community that so ably reflects the shared values of the people of Indiana. The current population is roughly 53,000, with a total of about a quarter-million living in the ten-mile area that surrounds the city. Median household Income is in excess of $55,000 a year. The median age in Greenwood is 34.6 years old, slightly younger than Indiana’s statewide median age of 37.3 years. According to the most recent census data, 11.6% of the city’s population are over the age of 65, a slight decline from the number of seniors present a decade before. Even with the decline, the seniors living in the Greenwood area represent a large segment of the population with unique and complex interests and concerns. Seniors in the area enjoy a wide variety of different lifestyles and household environments. Many continue to live independently, remaining in their own homes, apartments, and condominiums. Others have established communal living arrangements with friends and family members. Still others have opted to live in one of the area’s senior assisted living facilities. Caring.com has compiled list of nursing homes and other living facilities for seniors in Greenwood and nearby Indianapolis. Most have excellent reviews, indicating that seniors can expect quality service and careful attention to their specialized needs. A few have mixed reviews as well. Seniors or their families who are in the marketplace for an assisted living facility should carefully review their options and schedule visits to talk to staff on-site. To deal with the high cost of this care, families may want to consider in-home care – either relying on family members to provide most of the special care their aging loved ones need or paying a nursing service to come into the senior’s home to care for their most pressing needs. We understand that cost can be a major concern for many families, and can cause some seniors to put off these concerns for another day. The attorneys at Frank & Kraft can help you to plan now for the nursing home care you might need later, with a comprehensive toolkit of estate planning and asset protection solutions. We can help you better manage assets for Medicaid purposes, receive the veteran’s care to which you may be entitled, and utilize other strategies to ensure that your nursing home care is as affordable as possible when you need it most. Estate and elder law issues are complex, so you need an experienced hand managing your legal concerns and protecting your vital interests. Our legal team can provide you that experience and make sure that you have the tools you need to protect and grow your wealth throughout life, prepare for your own future health needs, and care for your family and other loved ones when you die. In Indiana, probate is handled in the county in which the deceased was living at the time of death. For residents in Johnson County, probate proceedings are handled by the Superior Court for Johnson County. The Courthouse address is 5 East Jefferson St, Franklin IN 46131. You can reach the Clerk of Court for additional information at (317) 346-4450 between the hours of 8:00 a.m. and 4:30 p.m. Monday through Friday, except on designation holidays. Unless an estate plan is in place and in proper order, probate will be required to handle the distribution of any estate’s assets after death. Probate court is also necessary for any proceedings involving guardianship. 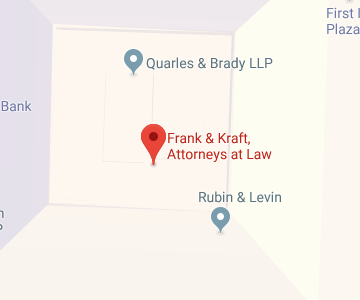 At Frank & Kraft, our attorneys can assist families in their efforts to navigate the complexities of the probate process, or secure legal guardianship of impaired and incapacitated family members in cases where those matters were not dealt with in the estate planning process. At Frank & Kraft Attorneys at Law, we have the experience needed to ensure that you receive the protection and guidance you need when handling all complex estate and elder law matters. We proudly serve the Greenwood and surrounding areas, and work to provide the high level of representation and advice that all our clients need to secure their interests. To discover how we can help you with your elder law and estate plan needs, call today at (317) 684-1100 or contact our legal professionals at our website.